The urban public right-of-way (roadspace) is a scarce resource that is now publicly allocated.Typically at the outside is a sidewalk (this might actually be on private property, but there is a right-of-passage there). Between the sidewalk and the street there is often a “boulevard”, a planted strip with occasional street trees and the frequent sign. There there is a curb and gutter. Next to this is the “street” on which may be on-street parking, followed by movement lanes. The on-street parking may be free or metered. In some places there are designated bike lanes, or even bus lanes. In some places the lanes are reversible in direction, in others they are one-way. There may be bus-stops. Underneath the road are public utilities (water, sewer, natural gas), above or below are cabled utilities (phone, electricity, television). There may be street-lighting. There may be wi-fi antennas on the street-lights. Some blocks are bisected by alleys, others see neighbors abut.If there is no alley, Garbage, recycling, and reuse trucks ply the roads, and the material for pickup is placed on the boulevard. Driveways may cut into the street. People may wait on the boulevard for buses (school buses or public transit). There may be a shelter, or a sign. The buses may stop on the right-of-way to board and alight passengers. We need to be more creative about how we allocate this space. In the US, most cities west of the Appalachians arrange the streets in a grid. This regular, monotonous, grid has many features, but one that is often not used to its fullest is the ability to differentiate. Presently the links on the grid are largely equivalent, except that some links are collectors and distributors, and serve residential land uses, while others are arterials and serve commercial land uses, and have transit running on them. Let’s imagine we have a significant commercial arterial every tenth east-west street (10th, 20th , 30th, and so on) (approximately every mile). How do we allocate the road space on the 9 blocks between them? Are they all the same (serving moving and stored cars), or can they be differentiated. Suppose instead of assuming all modes should mix (and therefore give dominance to the private automobile on all blocks since it has greater number, speed and mass and will win every conflict), let’s take one of those streets (say the Nines: 9th, 19th, 29th, 39th, etc.) and say it is for bicycles only. People who live on the Nines would have to park their cars on another block or in the alley behind, or maybe some off-street parking can be found. This bicycle-only street would only stop when crossing a major north-south arterial (and a yield at transit routes) or other specialize route below (i.e. on only half the blocks they would have a 50 percent chance of having a red light, and on the remaining blocks they would have unchallenged right-of-way). Suppose we dedicate the Fives (5th, 15th, 25th, 35th, etc.) exclusively to public transit and taxis. This route would be about one-half mile from the transit-served arterials, and thus would ensure all travelers are within a one-quarter mile route from a transit service (though perhaps a longer distance to a stop). The frequency here would be fairly high, and stops would be every 2.5 blocks, so the Manhattan (network) distance for the farthest passenger would be one-half mile. This route would be exclusively for transit (and taxi) movement and stops, and transit vehicles would not have to stop except at the arterials and other transit routes, where there would be stops and transfer points anyway. The Transit service would be laid out in a near perfect grid. Suppose we dedicate the Ones (1st, 11th, 21st, …) to truck movement. Trucks still need to move through the city, but the arterials are already congested with transit and private car traffic. Freight could use other links for access and egress to particular buildings, but use only the Ones for longer distance movements within the city. The roads would be rebuilt with much stronger pavements to withstand the greater use and abuse. Other vehicles could use the Ones, for movement but there would be no on-street parking here either. Suppose we dedicate the Threes and Sevens to one-way (west-bound and east-bound respectively) vehicular movements. These routes would move a bit faster than the two-way links, would not have to compete with stopping vehicles as much, and would draw longer distance traffic. They would be given a green wave at a socially desirable travel speed. We would do the same thing on north-south arterials, so that 29th Avenue (N-S) meeting 29th Street (E-W) would be a bicycle-only intersection. 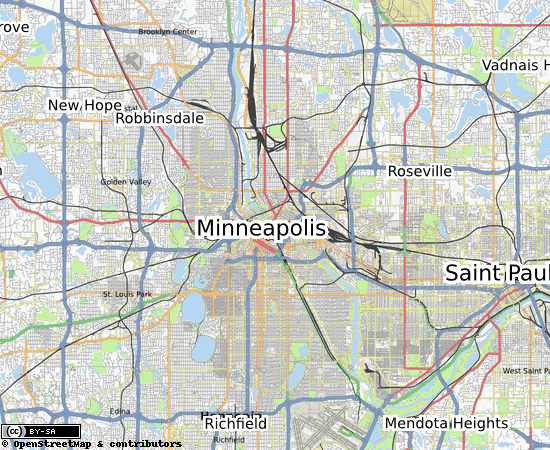 Some of this is familiar to Minneapolitans: 20th is Franklin Avenue, 30th is Lake Street. The Midtown Greenway is roughly 29th St (though of course it is better since it is an exclusive right-of-way). 26th St and 28th St are a one-way pair. But we have not done this strategically or fully. We mix transit and private cars on arterials. Transit buses run on 26th and 28th, not on 25th. We certainly mix trucks with cars excessively. I am not making a specific recommendation for specific routes, I am suggesting we systematically and multi-modally reconsider roadspace allocation in order to better facilitate the movement of multiple modes in a complex environment and develop a strategy for this. Clearly specific routes will need to be bent to fit the local landscape and built environment.